Last week, we talked about one aspect of mindful eating, the hunger scale – how you can monitor your own levels of fullness while eating simply by tuning into your body’s signals. But using the hunger scale as a tool pre-supposes a crucial sticking point – that you are eating in a place (and in a manner) that allows you to slow down and listen to your body. In the pace of life today, we spend large quantities of our day distracted, and this extends to our eating experiences. It’s possible to eat a meal and to not see our food beyond a quick glance, to not taste our food beyond biologically registering that it’s vaguely tasty and pleasing, and to not smell our food beyond its cursory presence. In other words, we miss out on so many of the sensual aspects of food by allowing distraction to creep into our already-rushed eating life. I want to write this post carefully, because something that I see in our 21st-century food culture is a tendency towards moralism around food. In other words, I find that (in general) we find it easier to adhere to food ideals if we can make them “right” or “wrong.” However, this isn’t necessarily a good thing. I see clients sometimes decide that a food is a “trigger food” (which is fine), but then feel terribly guilty any time they inevitably eat the food or something like it (which is less fine). I’m not being didactic. I’m not saying that eating while you’re driving is wrong, or that you should never do it. I simply want to invite you to examine your eating practices, and to be aware that the more you can create undistracted eating experiences where you can fully be present to your food and listen to your body, the more you will be in touch with your natural self-monitoring system and actually enjoy food. Moralism around food isn’t helpful. Eating is not a black-and-white issue. Instead, I encourage clients to see their well-being as a bank account – the more deposits you make, the better you’ll feel. When you have a robust bank account, you can handle withdrawals because they don’t deplete you. However, if you’re running on empty, even the smallest misstep can throw you off balance. Don’t focus on doing things perfectly, or having a rigid set of practices that are right or wrong. Instead, create an attitude of filling up your well-being bank account with positive food practices. Instead of making rules, focus instead on increasing the number of times you experience undistracted meals, and don’t worry about cutting out every single “bad” habit. Eat in the car less often. Sure, there are times when it’s practical. But if we take this to its fullest logical conclusion, the reality is that we probably really never need to eat in the car, other than long road trips. We often do it out of convenience. The problem, however, is that driving requires a requisite amount of attention. It’s difficult to give full attention to eating while you’re driving. To create more mindful eating experiences, I highly recommend that clients find ways to squeeze in those meals before or after the drive, if possible. I also want to add a side note that there is also a bigger picture here. Habits tend to be paired. 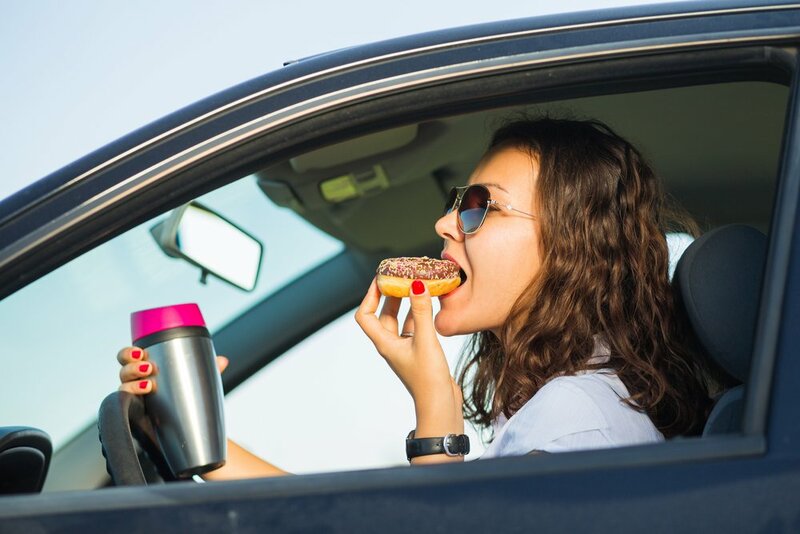 Eating while driving, for example, is often (but not always) coupled with lower-quality food choices, like convenience food. You may be pulling out the homemade sandwich at the wheel, but the great likelihood is that it’s something else. Minimizing this behavior (and not making it a habit, at the very least) will help you not only tune in to your body with greater attention to hunger, fullness, and the eating experience, but will also probably increase the quality of your overall food choices. Eat lunch at a table, without a computer or phone. This one’s a tough one for so many of my clients, especially in immersive workplaces like tech companies. It may seem tough, or even impossible, to take a lunch break, but I can promise you that even if you just put your computer to “sleep” while you eat at your desk, your eating experiences will be improved. If you can’t take a lunch break somewhere other than your desk, try to minimize tech distractions, and take time to really focus on eating. Pay attention to the tastes, textures, and aromas of your food. Look at your food. Take time chewing. Talk to the people around you. This is partly nutritive, but also psychological. Simply taking time to be undistracted and to focus on the experience at hand is good for our brains as well as our bodies. As I often tell clients, there will always be more work, but the present moment (and your opportunities to use it how you want) will never come again. Enjoy yourself. Try to minimize nighttime TV snacking. TV is the ultimate distraction. If you feel that you are “eating OK” but the scale is stuck, I would recommend experimenting with reducing or eliminating eating in front of the TV, especially at night. When you’re distracted and entertained, it’s easy to mindlessly consume more calories than you realize. 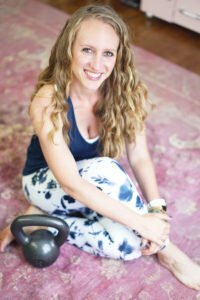 A cute (if overly reductionist) quote that I like is: “The most effective exercise you can do for fat loss is one rep of pushing your chair away from the table.” In other words, mindful eating, and thus being able to attend to the hunger scale, tends to improve when we “contain” eating experiences. If you eat at the table and then watch TV without snacks, you will probably not go back to the table to eat again, over and over again. Again, does this mean that you should never eat in front of the TV. It’s not an issue of “good” or “bad.” In fact, I eat in front of the TV more than I’d like to admit! It’s not about being moralistic. It’s all about finding those weak spots where you, as the individual, could improve your relationship with food. If you are at peace with your decision to eat in front of the TV, then don’t change a thing. However, I would add from a nutrition standpoint that there are some TV-related habits that are correlated with excess calorie consumption. One is simply watching a lot of TV. The National Weight Control Registry has noted that most participants who have successfully maintained weight loss watch 10 hours or less per week. This is an interesting challenge to try out even if you do choose to eat in front of the TV – what happens when you watch less than 10 hours per week? Also, what and how you eat in front of the TV play a huge role. Are you eating solo from an open, family-sized bag of popcorn? Are you ordering takeout and eating directly from the container? These habits are ones that tend to lead to weight gain anyway, but they’re amplified by watching TV, because we’re not paying attention. As I pointed out lat week, feeling a little hungry a few times a day is not dangerous or deadly. It’s simply a sign that eating should happen soon. However, something that I see in many of my clients is preventing hunger before they ever even sense it. A “bad habit” that I see frequently, for example, is keeping large-portion snacks at hand for at-will consumption (like a large bag of nuts in your office drawer). What I challenge clients to do is to eat sufficiently large meals, so that meals can be spaced out 3-5 hours apart. This practice reduces mindless snacking between meals, which can add up to significantly more than the extra few hundred calories that would make a meal fully satisfying. Here’s an example – if I see a client (who is trying to cut calories) eating a 300-calorie breakfast and a 300-calorie mid-morning snack, it would probably make more sense for that person to eat a 400- or 500-calorie breakfast and not eat again until lunch. Not only does it make sense from a caloric reduction standpoint, but it also helps people focus on their food as an eating experience, rather than overlaying distracted snacking onto their schedule. My advice? Clear your office of food. Don’t keep the protein bar or the bag of nuts in your work area. Instead, relegate your meals and snacks to the refrigerator, and eat when you actually intend to eat (and feel truly hungry), rather than grazing throughout the day. Then, when you’re actually hungry for a snack (which, for many people, happens around 3-4 PM), you can go get it. Last month in “The Hunger Scale: Recognizing Hunger and Fullness,” we explored using your own self-driven hunger and fullness index to help inform eating decisions. This week, I only have one question. Where do you see yourself being the most distracted in your eating? What concrete steps do you want to take to be more present to your eating experiences?